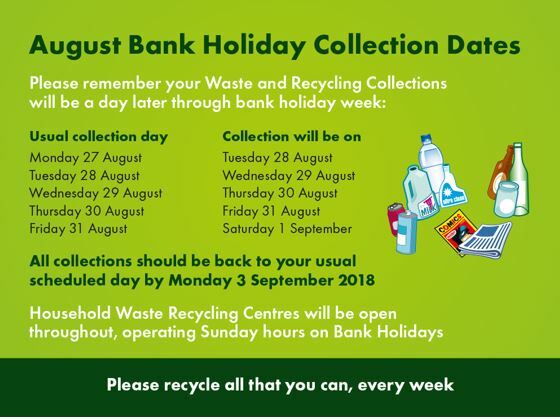 Waste and recycling collection dates will be affected by the August Bank Holiday as below. The Summer 2018 Waste and Recycling eZine has also been published and can be found online here or downloaded as a PDF. To subscribe to the Recycling eZine you can go to the eNewsletter subscription page. The Council offers a garden waste collection service. This is an opt-in service for residents who would like their garden waste collected from home, using a green wheelie bin. The service includes household garden waste; grass cuttings, leaves, hedge trimmings, flowers, twigs up to 4” in diameter, non-invasive weeds and pet bedding (rabbit or rodent only). We can remove your bulky household items (such as chairs, beds, tables, washing machines) from outside your house. Household items cost £25 per collection of up to 8 items, except fridges and freezers which are £25 per item.